For many years I have had an impossible dream for which I give credit to both my now deceased friend, Bob Evans, who made a fortune with a chain of restaurants, and to the American Plains buffalo. What could Bob have in common with the buffalo? Both believed fervently that animals could thrive on year-round grazing, come hell, high water or snow, without any soil cultivation for grains at all. Once Bob and the buffaloes got that notion lodged in my mind, I could no more deny it than I could deny that one plus one equals two. I spent the next 20 years seeing if I could mimic his efforts in northern Ohio on a very small acreage. Turned out to be easy in spring, summer, and fall once I rid my mind of thinking that farming was about growing annual grains and making the Chicago Board of Trade wealthy. But winter grazing in a harsher climate than Bob’s proved to be a real challenge. Northern pasture farmers were planting annual crops of turnips, winter rye, and grazing corn to beat the snow. Since my goal was to get away from the whole frightening cost of cultivating and harvesting crops, I wanted to avoid even this much annual cultivation if possible. After trying about every pasture plant that would stand above snow or endure being covered with snow temporarily, I learned from a rancher in Kansas, about the snow pasture possibilities of that old standby, red clover, supplemented by fescue which is a grass not as nutritious as clover but capable of providing some grazing all winter in more southern climes. Red clover is also a favorite hay crop of farmers here in Ohio, but I had never realized how it could be stockpiled for winter grazing (alfalfa works well this way too). 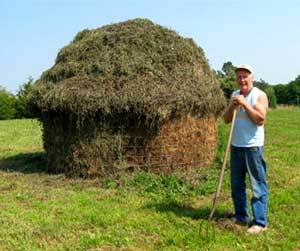 I simply needed to let it grow in late summer and fall, not cut it for hay. This was hard for a farmer with ingrained traditions of European husbandry to do. Let all that nice hay go to waste, turn brown and dead, and get buried under the snow? Hard to believe that. But I did know that red clover was the easiest of all the legumes to get started simply by broadcasting the seed on top of the ground in late winter. That meant no annual cultivation. Then agricultural researchers came out with findings indicating that late hay crops left standing in the field were still fairly nutritious even when grazed in winter when they were more or less dead and brown. So I gritted my teeth and let the late hay in one paddock grow two feet tall, blossom, go to seed and die. Being fairly upright, the plants would bear the weight of quite a bit of snow and still be semi-erect and therefore easily grazed. After we got our first five inches of snow in December, I turned the sheep in. First they ate off the dead blossoms and stems above the snow. An old herbal of mine says that red clover blossoms and seeds are “…one of God’s greatest blessings to man … a wonderful blood purifier…excellent for cancer of the stomach … and various spasms … very soothing to the nerves.” I wonder if the sheep know that. Then they pushed down through the snow and burrowed along, grazing just like buffalo do, bulldozing the snow out of the way with their heads. Amazing grace. A second five inches of snow fell the next week. Same story. The plot, which is hardly an acre in size, fed 20 sheep until Christmas and is still providing a little clover and some fescue to nibble on as I write this. If I had a couple more acres of snow pasture, the sheep could graze until the middle of January, maybe longer, maybe until the bluegrass in other pastures starts to grow in March. Being basically a disbeliever, I’ve never had the guts to stockpile enough clover in the fall to find out. 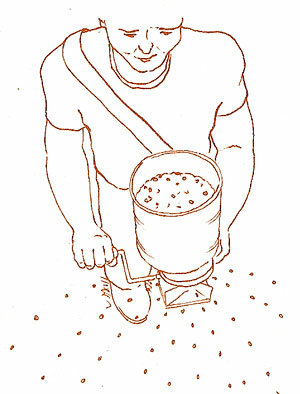 A side benefit: some of the clover seeds missed by the sheep or passed through the sheep in the manure, will sprout in the spring and make a new stand. Bless you, Bob. Bless you, buffalo. The Man Who Created Paradise was originally published in a hardcover-only edition back in 2001. Ohio University Press continued to field requests when the book was no longer available, but it was a difficult reprint thanks to the square format and the halftone photos. At long last, we’re proud to bring Gene’s inspirational fable back into circulation in an attractive paperback edition. The Man Who Created Paradise: A Fable, is a short, inspirational book, 72 pages, that tells the story of a landscape despoiled by strip mining. In the book, the narrator drives from Cincinnati to “Old Salem,” Ohio, to meet a correspondent. Along the way he is depressed by the scenery and its industrial heritage. But he ends up meeting a man who has begun reclaiming the land with just a personal mission and a single tractor. The encounter is a tonic to the narrator—he sees the land turned back to fertility and attractiveness, and realizes the man (Wally Spero) is on to something. Many years later, he revisits and finds that the little gem of green Spero created has spread, and now there’s a community of like-minded farmers and craftspeople who have created a vibrant, sustainable local economy. Available from your local independent bookstores here.